In contrast, high-speed rail in the US often feels like vaporware. The closest thing we have to it is the Acela Express, an East Coast Amtrak train that tops out at 150 miles per hour. While proposals in places like Florida have sputtered out, California and Texas currently have the most enduring high-speed rail plans. One of the biggest hurdles for any of these plans is getting Americans to embrace train culture; convincing car-loving Americans to get literally onboard is a challenge—and one not made any easier by the recent Amtrak tragedy in Philadelphia. To make sure we pull this off, we need to be importing the right kind of train. A train that’s safe, fast, quiet, eco-friendly, and something that people actually want to ride. That train should come from Japan. You may be thinking, why Japan? Other countries have faster trains! China’s commercial maglev goes up to 270 mph! True. And shinkansen “only” goes a max of 200 miles an hour. Well, when you’re implementing an entirely new travel infrastructure in a country full of skeptics, and are looking to fundamentally change how people move about cities, you need to play the long game. Speed alone isn’t important. So is safety. Low emissions. Passenger comfort. Running on time. Japan’s bullet train, called “shinkansen” in Japanese, which means “new trunk line,” was the first high-speed rail system on Earth. Since its opening in 1964, several other countries have followed its lead. In Japan, their high-speed trains service over 150 million people a year. The trains’ aerodynamic design bestow them with their demon speed, and the tracks are built without curves to allow full throttle. 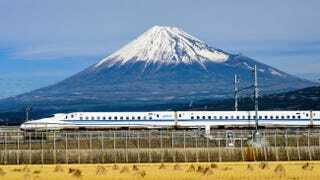 A long-time icon of Japan’s breakneck post-war technological progress, you’ve probably seen it on postcards: a sleek silver streak hurtling in between dainty pink cherry blossoms and a snow-capped Mt. Fuji. In its 51 years rocketing humans up and down the Japanese archipelago, the entire shinkansen network has transported over 10 billion passengers. There are several different lines, but the most traversed is the Tokaido line, which bolts folks from Tokyo to Osaka in under two-and-a-half hours one way. That’s a journey over 300 miles—almost the same distance as California’s planned rail corridor linking SF and LA. In Japan, delays aren’t measured in hours or minutes, they’re measured in seconds. The average shinkansen delay is 36 seconds, even in bad weather. The shinkansen’s safety record is quite the accomplishment, especially when you consider Japan’s kaleidoscope of natural disasters that pummels the tiny island nation: Typhoons, heavy snow, landslides, and the biggest threat, earthquakes. In 2011, 27 shinkansen trains were skimming the country the afternoon of March 11 when a 9.0 megaquake struck, the worst in the country’s history and the fourth strongest quake since human record-keeping began in 1900. Emergency brakes were triggered seconds before the main quake hit. There were no fatalities or injuries. Meanwhile, Japan crams 127 million humans into a largely mountainous island chain where livable land is limited. How do you build public transportation in such a setting, while also staving off seismic threats? Great engineering. Along Japan’s plentiful coastlines, inland areas, and along railways, shake-sensing seismometers are shoved deep into the ground. When Mother Nature lets a temblor loose, those sensors pick up on the budding quake’s “P-waves” (the preliminary seismic waves it emits), and before the more intense “S-waves” arrive (the destructive second wave of activity), the trains’ electricity supply is cut. This automatically employs the emergency brakes, essentially beating the earthquake to the punch by stopping the trains early. The shinkansen’s elevated tracks, meanwhile, are built on reinforced columns that use an X-shape bracing that mitigates tremors. Tracks are also lined with derailment prevention guards that prevent the train from derailing or tipping over during an earthquake. The shinkansen is a Japanese icon. Over 420,000 ride every day on the Tokyo-Osaka route alone. Visitors want that picture postcard experience of zipping down sakura-lined passages at lightning speeds in supreme comfort, eating a shrimp bento and sipping a Sapporo. The Japanese government knows this. So they want to export shinkansen to make money and show off their technology. In varying degrees of interest to implementation, several countries have worked with Japan to import bullet trains, like Taiwan, India, the UK, Brazil, and China. (In fact, one of the two trains involved in China’s high-speed rail crash in 2011 was built to resemble a Japanese bullet train—but Chinese investigators said management problems following faulty signaling were to blame.) Just last week, Japan signed a deal with Thailand to bring bullet train tech to that country. Last month, Japanese Prime Minister Shinzo Abe, while on a diplomatic visit to the US, met with California Governor Jerry Brown to pitch the Japanese bullet train to California. Additionally, since last year, the prime minister has been pitching the US a super bullet train: maglev, a souped-up edition of high-speed rail. He wants this one built between Washington DC and Baltimore. Last month, an experimental maglev train in Japan broke a world record train speed (a mind-boggling 366 miles per hour). Maglev, short for magnetic levitation, are trains that use magnets to “float” along the rails. Instead of wheels, electromagnetic forces pull the train along the tracks, making the ride lighter and quieter and speedier. And it sounds like Japan’s ready to put its money where its mouth is. There have been reports that the Japan Bank for International Cooperation is willing to pay the US $5 billion to help build that Baltimore-DC maglev. It’s a move that could help make the journey between the two an incredulously short 15 minutes. The Lone Star state is a solid, if surprising, candidate for Japanese high-speed rail. Houston and Dallas are the fourth and ninth biggest cities in the US, respectively. Every week, 50,000 commuters drive between the two. Plus, the particularly large and sprawling Texas is an economic powerhouse, housing some of the nation’s fastest-growing cities and adding more jobs in 2014 than any other state. Dallas and Houston boast two of America’s fastest growing populations. If Texas were its own country, it would have the twelfth biggest GDP in the world. The state wants to brand itself as forward-thinking and wants to keep pace with rich EU nations and innovative Asian markets. Texas has fully committed to copying Japan’s bullet train. A high-speed rail route is being planned to link the 240 miles between Dallas and Houston in a 90-minute, one-way shot. Texas Central Railway, a private organization, is working with Central Japan Railways—an arm of Japan Railways Group, the company that operates all bullet trains in Japan. They have agreed to plop an actual Japanese shinkansen in the middle of cowboy country. “We’re going to bring what we believe is the world-class, best technology to Texas,” says Shaun McCabe, Vice President of Environmental and Engineering at Texas Central. How similar will the Texas trains be to Japan’s? “Ninety-nine percent carbon copies,” McCabe says. The company’s got it’s work cut out for it: nailing down land use, navigating regulations, working with the Federal Railroad Administration for a host of approvals—this ain’t happening tomorrow, though they have an ambitious deadline of 2021. And unlike California’s high-speed rail project (which again, started building back in January), construction in Texas can’t even start yet until it gets those many ducks in a row. Over on the West Coast, the California High-Speed Rail Authority has set a deadline of 2029 for completion, and construction on the $68 billion federally funded project is already underway. This publicly funded venture will eventually enable a trip from San Francisco to Los Angeles in under three hours—yet the state hasn’t chosen a specific high-speed infrastructure to adopt. There are a few reasons California should consider Japan’s bullet train as a model. Geography, for one: The Golden State is one of Japan’s fellow Pacific Rim straddlers. And geology: According to the USGS, California’s chances of an earthquake at least 8.0 in magnitude within the next three decades has risen from 4.7% to 7%. The new trains will be in full service in that window. Shinkansen has other selling points besides neutralizing quakes. Its cars are nearly a foot-and-a-half wider than France’s TGV or Germany’s ICE high-speed trains, fitting in more passengers. That’s good news for densely populated states that are growing all the time. The N700 shinkansen train—the one Texas has said it’s planned to use—packs in over 80 seats per car, versus around 40 in France’s trains and 50 in Germany’s. But California still isn’t sold on the shinkansen yet. After all, only about 75 percent of California’s high-speed rail tracks are planned to be dedicated exclusively for high-speed service. The plan is to blend some of it with the alignments for Caltrain, an existing rail service in the Bay Area, and possibly tracks around LA’s Union Station. That stipulation makes it difficult to adopt the shinkansen system, which use its own tracks. Dedicated rails are needed for fast, more effective service, since those bullet trains are not sharing rails with slower, normal-speed trains. Also, many high-speed trains aren’t usually level with the ground, so they don’t always have to pass through railroad crossings that pose a safety threat to motorists. Finally, to get the shinkansen’s crucial anti-quake protections, you need to construct custom tracks with that technology built-in. Unfortunately, a lot of Americans still think high-speed rail is a waste of time and money. Citizen groups have popped up in both California and Texas demanding scrutiny for these gargantuan infrastructural projects that engulf tax dollars and invade people’s property. President Obama has said he wants to connect 80% of the country by high-speed train within the next two decades, but progress has been moving glacially. From personal experience, I know that riding the shinkansen is a slightly out-of-body experience that borders a Jetsons episode. Fun and futuristic weirdness aside, it’s also incredibly convenient. It has none of the hidden fees, security rigamarole, discomfort, or interminable taxi times that flying has. The always on-time shinkansen’s dependability and technology set the gold standard. And—most importantly—the safety stats speak for themselves. High-speed rail will revolutionize American travel. To make sure that happens, we must take cues from the country that does it best. To move forward, we have to look east.